Sensory bottles are an easy home made toy that children of all ages will play with for hours. They are attracted by the visual beauty, and we have discovered that the colorful bottles can be an educational substitute for screen time. 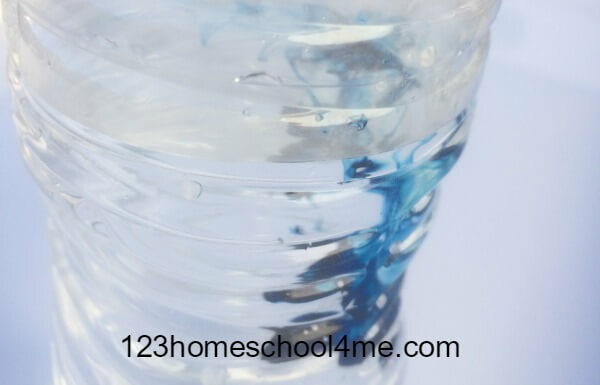 By asking your child to design his own, you’ll be setting him up to do some chemical engineering as he experiments of with the properties of every fluids that you keep in your house. Warning. Always have your young scientist work in a well ventilated space, and take time to mix fluid in small quantities before combining larger quantities. Some combinations will produce gas that should not be inhaled, and others could be explosive. Which two fluids do you want to mix in your bottle? 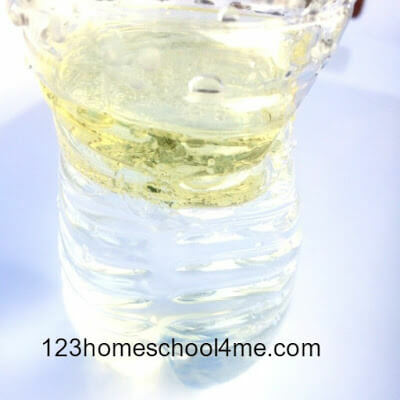 Vinegar and hydrogen peroxide are acids. Acids are chemicals which easily give away electrons when in contact with bases. Bases are chemicals which easily accept electrons. Vinegar and hydrogen peroxide are weak acids though, which means that they won’t give up their electrons too easily. Rubbing alcohol is a base. Bases tend to take electrons. Water is neutral. Water is also a polar molecule. It will tend to pull apart other chemicals causing the to mix with the water. This is why water is called the universal solvent, and is the best way to clean almost anything. Some chemicals are more soluble, than others. Soluble means they pull apart easily. Finally, Each chemical has it’s own density. Some are more dense, or heavier. Some some are less dense or lighter. 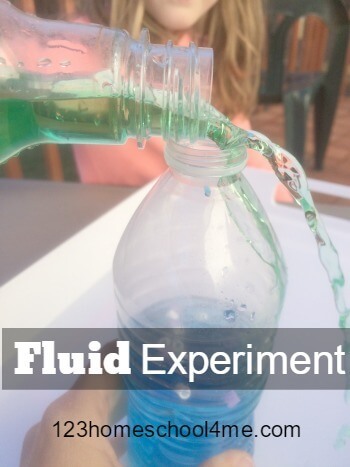 Play around to find two fluids that behave in a way that will make your sensory bottle interesting. 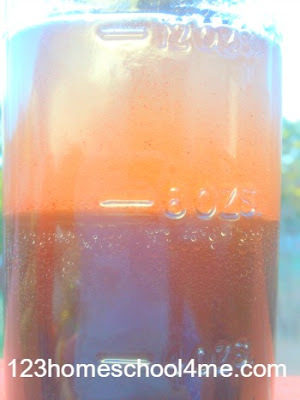 Once you’ve chosen your two fluids, try to add color. Did your fluids easily accept the color? You may want to change your choice of fluids. Finally, fill your bottle using your choices of colored fluids. You can also add small beads or other objects that will be carried as the fluids move past each other. Fasten the lid securely. You can use hot glue to help prevent leaks. Turn your bottle upside down and watch what happens. What other combinations would you like to try? 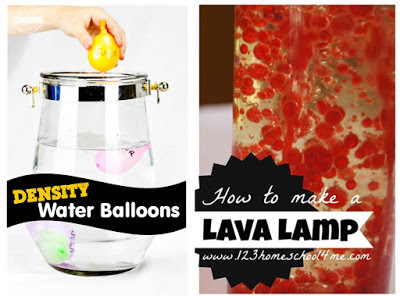 Some other chemistry experiments you might want to try are Pumpkin chemistry and Valentine’s day experiment.